This may be the last opportunity for me to put Winston on the list as a streamer. Not to make light of the actions that got him suspended, or any of the other things he’s been accused of, but I am here to help you with your fantasy lineup, not try and provide you with a moral compass. If you don’t want to roster morally questionable players, all the power to you, but also consider that this is a fake game we’re playing and you’re not actually having to pay these guys or take the publicity hit like an NFL owner. 2017 was likely considered a disappointment for Winston, but there were some positives to take away from the season. First, he averaged 269.5 yards per game, and that is including the 2 games that he didn’t finish, which would make it 305.9 yards per game that he finished. In games that he started and finished, he average 1.72 TDs and 14.36 points with 4 point per passing TD. In 2017, Jameis did show that his understanding of the NFL has been growing. He had the best QB rating of his career at 92.2, the lowest interception rate at 2.5%, the best completion rate at 63.5%, and his best adjusted yards and net adjusted yards per attempt. We’ve seen that the Bucs offense seems to have moved forward with the development of OJ Howard and Chris Godwin with Desean Jackson still making his big plays and Mike Evans reminding us that he’s one of the most gifted receivers in the league. If all that wasn’t enough, the Buccaneers also get to face the depleted Falcons defense this week. After last week when the Steelers hung 41 points on them, the Falcons have now moved to the top of the points allowed leaderboard while allowing the 4th most yardage. They have given up the most rushing TDs and the 2nd most passing TDs in the league. They’ve also committed the 3rd most penalties with the 3rd most penalty yards. If you listened to the pre-season rookie profiles podcast that Donkey Teeth and I did, you know that Darnold was my favorite of the rookie quarterbacks. His poise in the pocket, understanding of a pro style offense, and the ability to put touch on the ball when he needed to lead me to believe he was more prepared to start in his rookie year than any of the other rookie QBs. The yardage may not be overly impressive, but if you’re looking down in this range, you can do a lot worse than Sam. While only the week 5 performance was over 20 points, he has reached double digits in all but one start so far. He only has 1 game over 200 yards (334 against Miami), but the offense has shown the ability to put up some points this season, which is a bit of a shock. They put up 48 against the Lions in week 1 and hung 34 with 3 passing TD against the Broncos once feared defense last week. We saw Darnold stretch the field with Robby Anderson last week and hope that is the start of the Jets allowing Darnold a little more freedom in the offense along with some improved confidence in making those throws. Later in the article I’m going to try and talk you into the Colts as a deep streaming option at defense, but it’s also a pretty decent matchup for Darnold. The Colts have shown improvement against the run this season, but are still struggling against the pass. They have allowed the 2nd most completions and the 5th most yards while sitting about mid pack in TDs allowed and interceptions. They are giving up the 9th most fantasy points to the quarterback position this year. Brate was largely ignored in the offense to start the season with it seeming that O.J. Howard had taken a step forward and was the preferred tight end target for Ryan Fitzpatrick. However, in week 3, we saw the Bucs go to more of a timeshare among the TE targets in the offense, and in week 4 O.J. Howard left the game early with an MCL sprain that sounds like it will take 2-4 weeks for recovery. This happens to coincide with the return of Jameis Winston who seemed to prefer Brate over Howard last season. Although, we won’t know whether that was based on a connection the two have, or if it was more about Howard understanding where to be on the field as a rookie. In 2017, Brate finished as the 8th best TE in standard scoring and 10th in PPR. With the injury to Howard, I expect Brate to resume that pace from last season and be a worth streamer, if not more, at least until Howard comes back. The match-up is a juicy one, as mentioned above in the Jameis article, but just wanted to expand upon that a little more. The Falcons have given up the 3rd most receptions and 8th most yards through the air. The 12 TDs allowed to the pass are the 3rd worst in the league, which should lead to plenty of opportunities for all the passing catchers in Tampa Bay. Cincinnati has been decimated at the tight end position as they lost the oft-injured Tyler Eifert who has been placed on the injured reserved and Uzomah actually had already started to carve out a piece of the offense even when Eifert was present. Uzomah was a high school basketball player who has never been given the opportunity to show what he can do, first in college No Eifert and sounds like Tyler Kroft also may miss this week leaving CJ Uzomah as the only act in town. They go against the Pittsburgh Steelers this week in what usually ends up being a tough divisional match-up, but is a nice one for Uzomah and the Bengals offense as a whole. The Steelers have given up the most fantasy points to tight ends on the season with the most receptions, 2nd most yardage, and tied for 3rd in TD allowed to the position. The Steelers defense as a whole has allowed the 8th most points, and 3rd most total and passing yards. The defense has been stronger against the run, but air traffic controllers are employed by the Steelers to wave around all the flying around the field on their defense. The Green Bay defense, at least statistically, has been a fairly strong unit on the season. Some of that may be about the opponents as the Lions are the only top 15 scoring offense that they have faced to this point, but the defense has performed against opponents that it is supposed to stop. As a unit, the defense has allowed the 14th fewest total points and the 6th fewest yards. They’ve been more susceptible to the run coming in at 15th, but have given up the 4th fewest passing yards and tied for the 12th fewest passing TDs. They are 5th best in both scoring percentage and net yards gained per pass attempt. I understand that CJ Beathard has managed to have 2 pseudo successful weeks as he takes over for Jimmy Garoppolo in the Shanahan offense, but let’s just say that I’m skeptical we see this continue. He has thrown 2 picks each game. The Cardinals sacked Beathard 4 times and the Packers are 5th on the season with 16 sacks. I am not recommending that you sit down an established defense for the Colts, but if you’re looking around at the bottom of the wire, I think they could be a decent option. They are 14th in yards per rushing attempt and tied for 16th in net yards gained per pass attempt. They certainly haven’t been a strong group, but they have created turnovers as they are tied for 10th most in the league at 8 (5 of which are interceptions). Speaking of interceptions, the Colts go against Darnold who has thrown 6 interceptions on the season. The Jets offense has been better than you’d expect coming into the game with the 11th most points, but also down at 23rd in yardage. The Jets have been stronger rushing the ball than throwing and the Colts have been stronger protecting against the run, so, could be the right match-up for the defense to pull it together. @miles proudfoot: It depends a bit on your needs, but I’d be comfortable dropping Cole. I do like his talent, but it’s hard to trust anyone week to week in that Jaguars passing game. 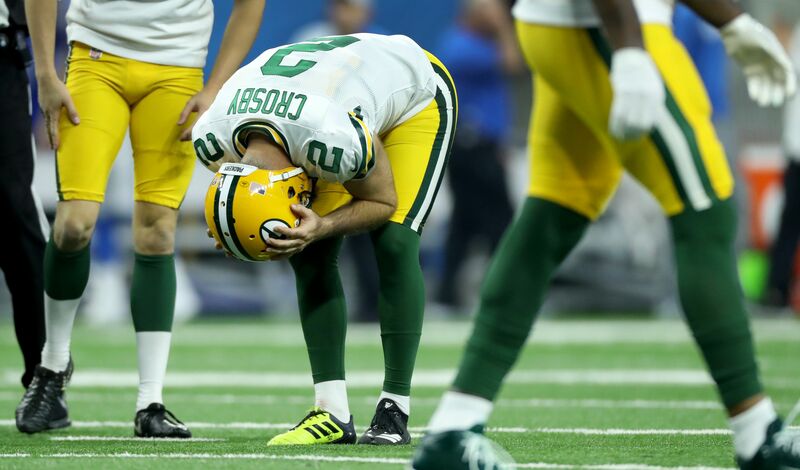 I’d hang on to Cobb, but if Rodgers goes down, he can go. Of the names listed, I think Ronald Jones is an interesting pick up as he gets his opportunity. I love what Marqise Goodwin does on the field, so, if you can wait, I like his upside. I am currently in an 18 Team League and sit in 14th with top 8 making playoffs. @Maverick: Assuming this is re-draft, I’d take the Bell/Jones side of the trade. Michael Thomas is amazing, but I expect Le’veon to be so when he comes back and you get Marvin kicked in as well. Working on a couple trades right now.. James White for Fournette in 12 team standard? Is white too much or not enough? A Brown, Crowell, and Henry for my Adam Thielen and Tareek Cohen? @Nate Drizzy: Assuming you can take the hit for week 6, I’d trade White for Fournette. I’d be surprised if the Fournette owner makes that deal. I’d take the Brown/Crowell/Henry side of that deal.